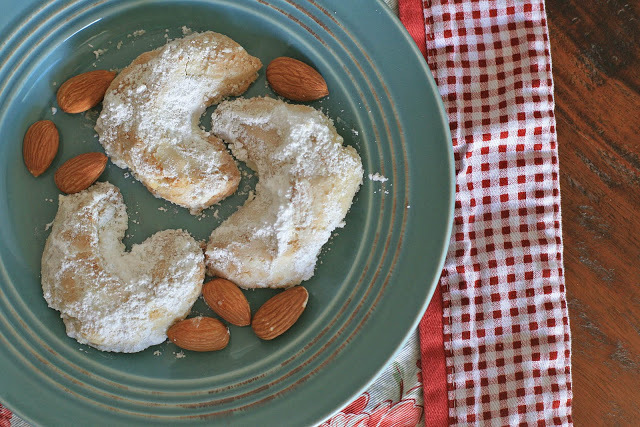 Love Mexican Wedding cookies, almond cookies, and/or shortbread cookies? Well, then I think these will be right up your alley. According to the Internet (and the Internet never lies, right?) these cookies are a must-have dessert at all Greek celebrations, including weddings and holidays. 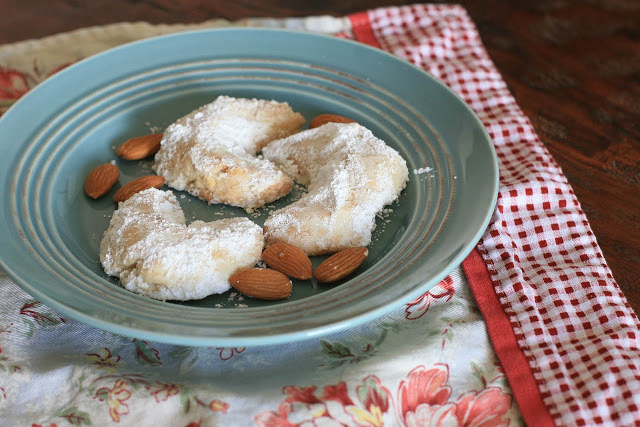 Buttery almond shortbread covered with a generous amount of powdered sugar? Um, yeah… it’s pretty easy to see why they’re so popular. This-gluten free version is made with ground almond flour, a mix of gluten-free flours and starches, powdered sugar and plenty of butter. Want to add a little something special? Add a drop or two of rosewater on each cookie prior to dusting them in powdered sugar- it adds a subtle and delicate floral fragrance that you’ll notice just before each bite. Beat the butter and confectioner’s sugar in a large bowl until light and fluffy. Add the vanilla and egg yolk and beat another minute. Add the rice flour, sorghum flour, potato starch, almond flour, xanthan gum, baking powder and salt and mix until smooth. Cover and refrigerate dough for at least one hour. Knead by hand and take small pieces of dough, roughly the size of a Tablespoon, and roll into a C shape. Place on a baking sheet and bake for approximately 12-15 minutes, or until the cookies begin to turn golden. Let cool on the baking sheet for about 2 minutes, and then transfer to a cooling rack. Place a drop or two of rosewater on the surface of the cookie, if using, and then sift some extra confectioner’s sugar over the top of the cookies. Note: You can also roll the dough into small balls and the roll in confectioner’s sugar prior to baking.